Golden Apples: Sock Yarn--Can you ever have too much? Sock Yarn--Can you ever have too much? Really, is there such a thing as too much sock yarn? When I decided to join the Red Sock knit-along, I knew I had some red yarn in my stash. And my sock yarn has it's own little shelf... so I knew it wouldn't be impossible (or even difficult) to find. As I dug the red sock yarn out, I also organized re-organized a bit.. I have 5(five) 2 gallon zip lock bags that each hold 15 50 gram balls.. (5 X15=75 balls or so.. or 35 potential pairs of socks..
Left overs, and in some cases, samples (from Jennifer) and rescues.. I love taking odds and ends and bits and pieces and making socks from scraps. It is, needless to say, pretty clear, I have NO NEED for sock. And then, what does Coat's and Clark's do? Get's on the bandwagon, and offer some bright pretty self striping mostly wool yarns—at reasonable prices! Mellow, Razzle Dazzle and Spring—all bright colors, jewel tones, and in the case of Razzle Dazzle, colors that I was totally lacking...--in both knit socks and stash! So, 3 balls of my stash are well on the way to being socks –and 6 new balls of yarn have forced themselves into the stash. 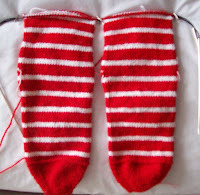 The Rag Doll sock have 6 pattern repeats before the heel, and currently are 2 rounds short of 4 repeats after the heel. There will be at least 6 pattern repeats before the cuff--Which I think might be white, with the final few rows red. Even the summer croc socks show signs of being finished before the dog days depart! Like I said on Sunday - those red striped socks are absolutely wonderful. So cheery! I dont think there can ever be to much yarn, sock or otherwise!! Love the red socks!! No, well, a qualified no.. you really do need to be able to get around inside of a house. ;) otherwise, "no".